With all that background, we'll now shift gears to look briefly at where string theory came from. It didn't even start out as an attempt to unify physics: it was an attempt to explain nuclear interactions, inspired by some suggestive features of the observed particle spectrum. I couldn't possibly tell the whole history of string theory here, but I'll give a bit of an outline. Here are a few rough dates, with even rougher descriptions; if you want the details (or anything close to a complete list of important events), you should probably look elsewhere. And if some of this doesn't make a lot of sense, skip it for now and look again once you've seen the rest of this talk and have a better sense of what string theory is all about. The first "dual models" are born. As I understand it, these theories originated as a purely esthetic solution to some theoretical and experimental puzzles involving the strong nuclear force. It took a while before people recognized that the mathematics of the theories could be derived as the behavior of fundamental strings (instead of fundamental particles). Quantum Chromodymaics (the QFT-based attempt to describe the strong nuclear force) starts "winning", as experiments verify its predictions rather than those of early string theory. Most physicists write off string theory as a failure as a result, but a few remain convinced of its underlying value and reinterpret it (or perhaps more accurately, "recognize it") as a theory of quantum gravity. The idea of spacetime "supersymmetry" is developed, inspired by the invention of "worldsheet" supersymmetry in string theory. While string theory falls into disfavor after its experimental failure as a strong force mechanism, supersymmetry becomes a very active area of theoretical research. A new insight, the "GSO projection", shows how destabilizing "tachyons" can be removed consistently from string theories with worldsheet supersymmetry. This clears one major (and potentially fatal) roadblock from the theory. It is discovered that these GSO strings have spacetime supersymmetry, not just worldsheet supersymmetry. This begins to move string theory closer to the current mainstream of high energy physics. Two great advances launch the "first superstring revolution": First, "anomaly cancellation" shows that certain subtle inconsistencies that seemed to doom string theory miraculously cancel out in the three known types of superstring theory. And second, two more cases where they cancel out are found and explored, giving rise to the "heterotic string" which holds great promise for describing the standard model. These developments generate tremendous excitement, and bring string theory back into the mainstream. However, by the late 1980s the pace of discovery has slowed. One concern was that there seemed to be five distinct but equally good types of string theory: "Type I", "Type IIA", "Type IIB", "Heterotic SO(32)", and "Heterotic E8xE8". The study of "dualities" and the discovery of "D-branes" launch the "second superstring revolution". In particular, study of dualities showed that the five seemingly distinct string theories were actually related to one another (when parameters like the interaction strengths or sizes of extra dimensions vary from small to large). We'll talk about "T-duality" and D-branes in more depth at the end of this talk, but the momentum of these discoveries fueled excitement and research in string theory throughout the 1990s and continues to be a critical component of research today. 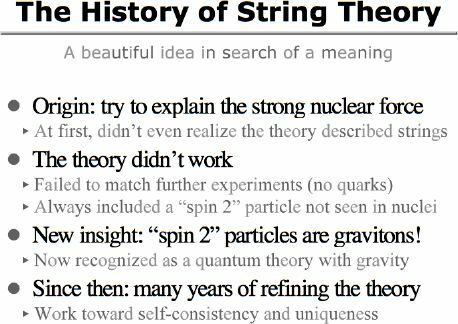 As I said, that's the barest outline of a few critical events in the history of string theory, and many parts of it probably won't make sense until and unless you have at least some idea of what string theory is all about. But now that you've gotten a glimpse of where string theory came from, it's time to delve into the mechanics of the theory itself. Up to my research page. Up to my professional page. Copyright © 2004 by Steuard Jensen.